After squandering his lottery winnings and after his father loses his job, Mitch Baldwin, a 30-year-old living at home, gets the idea to rent out a room in their house so the family can get by. The renter, however, quickly endears himself to Mitch's parents and seems bent on getting Mitch out of the picture. A movie about perpetual man-children feuding? Sign us up! We saw "Room for Rent" as part of the San Diego International Film Festival. It is a comedy written and directed by Matthew Atkinson and tells the story of Mitch Baldwin, played by Mark Little, an 18-year-old who won $3.5 million in the lottery. He went on to squander his moolah over the next few years because of bad investments and frivolous purchases. It all sort of got out of hand for him as he tried to put his fingers in lots of pies and buy his friendships...you know, the things you would expect a young adult to do when in possession of millions of dollars. After his father Warren, played by "Kids in the Hall" alum Mark McKinney, is forced to retire, the family may have to sell their home in order to get by. In order to save it, Mitch decides to rent out the spare room in their house. Shortly after he puts a sign in the window, the room is rented by a man named Carl Lemay, played by Brett Gelman, who seems like an ideal tenant at first. As time goes by, Mitch starts to suspect he has ulterior motives in renting the room and thinks Carl may be trying to push him out, essentially turning this into a case of "Step Brothers" meets "The Hand that Rocks the Cradle" shrouded in a little more mystery. The good news is there are quite a few laughs to be had watching "Room for Rent." 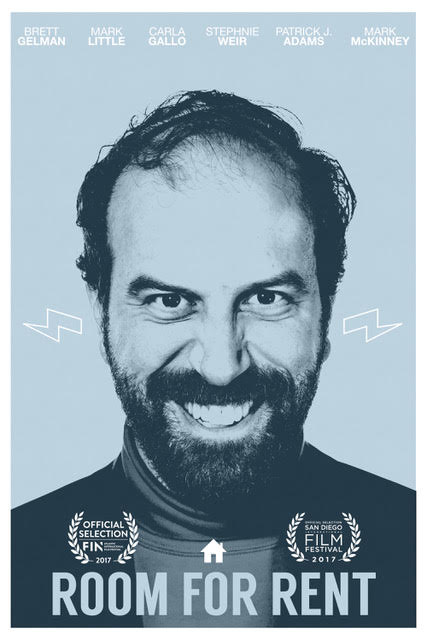 Brett Gelman does a spectacular job creating numerous awkward encounters with Mitch, who is sort of selfish and sullen. Much of the humor is situational in that it pokes fun at Mitch being a 30-year-old loser who lives at home with his parents. Mitch is someone who still expects his mother to clean up after him and refuses to seek outside employment because "he is too busy being an entrepreneur." When Carl shows up one rainy night, it seems all of their problems will be solved. Their interactions are terse at first, but when Mitch finally opens up, the two act more like friends...until it becomes painfully obvious that Carl might not be who he says he is. Shenanigans are sure to ensue. It's fun to imagine what we would do if we came into possession of $3.5 million dollars. A lot of the jokes here revolve around how Mitch blew his millions on very bad investments and inventions, one of which is a line of talking, lifelike Mitch dolls that utter sexually suggestive phrases and were meant to be marketed towards young girls. It's ridiculous and hilarious. That's not the only invention he sunk his teeth into, and we're not going to lie, we're going to need an Evaporella, like, now. An umbrella that heats up and evaporates falling raindrops? We'll take 10. We get to laugh at the absurdity of these creations and all the other ways Mitch blew his money, but we're also kind of dumbfounded with how stupid he was to throw his money away. "Room for Rent" may be well acted and pretty funny, but it is not a perfect film. We do think the overall narrative could have been a little better and a little more engaging. It is not boring by any means, and we remained entertained for the most part, but much of the film seems more like an extended sitcom pilot than an actual feature film. It doesn't take very many risks and follows the same tried and true comedy formula we've come to see in movies and television for decades. In the end, though this is funnier than many of the comedies we've had to sit through this year, "Room for Rent" nestles itself in the safe zone as an average comedy that just so happens to have good acting, great chesmitry between characters, and a handful of big laughs.